There are many things to consider when starting with Linux. One of the most important is how you are going to make the change. If you have only used operating systems that came pre-installed on your computer you maybe surprised to learn there is a choice here at all. 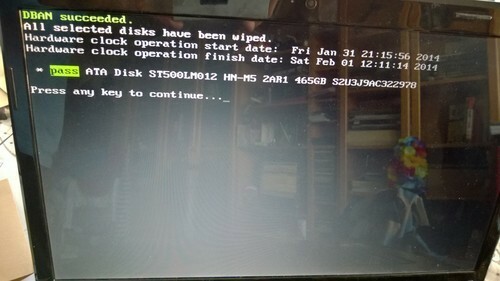 Linux can be booted from a CD or USB. When doing this it leaves the hard drive totally unaffected. This means that it is very easy to try a version of Linux because next time you start your computer you are able to access your old system with no changes. This is not surprisingly the recommended course of action to get a preview. It is also possible to have Linux and another OS coexist on the same machine. This can be done by partitioning the drive you will then be given the choice on which system to use every time you start your computer. There are disadvantages to these setups. You will make the change to the new slower, preferring to stick with what you know over what is best. It will also add clutter to your system. Therefor I decided on neither of the above and went for the far more direct approach. I first saved anything of importance and then wiped clean my hard drive before installing from scratch. I used dban to wipe my hard-drive. A fun little program it gives you the choice of which military specification wiping algorithm you would like to use. I chose the US Army standard. It took 16hrs to get through completely, but then again it did have to write over my entire hard drive 7 times. I first booted from a CD (There was a lot of noise before but I assume that is the fault of my slightly aging CD dive) and the full OS loads up. To install is fantastically easy just click the icon sitting pretty on the desktop. That is it, much more convenient and much less nerdy than I had been led to believe. There are countless blogs offering opinions that may help your just confuse the decision. In the end I went for Linux Mint with Cinnamon. There is much more to say on this topic but before this post gets away from me I will wrap it up here and report back on my first few weeks of use.